I walked through the maze of sandstone walls. The sun brought out the red, orange and yellow lines of the smooth stone walls that surrounded me. I walked on letting the walls lead the way. The remnants of Nabathian street signs and welcome statues lined the maze walls. I felt like Indiana Jones as horse pulled carriages zoomed past me. I turned the corner and as if a curtain had been pulled open the walls gave way to a spectacular castle carved into the orange stone before me. 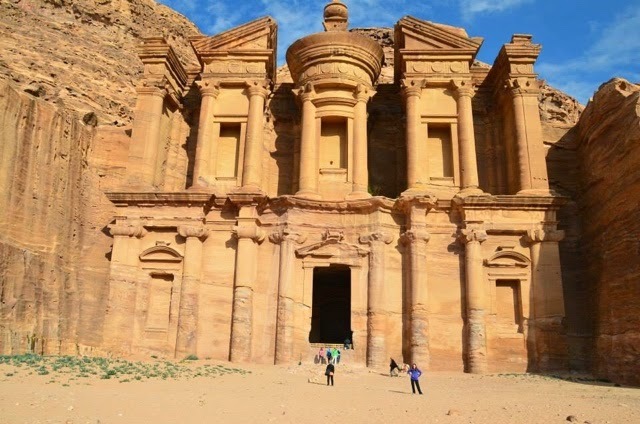 The treasury is the first carved building that visitors of Petra will see as they navigate the old streets of the once bustling Nabathian city. It's spectacular detail and size makes you wonder how they carved it by hand. This magnificent building is only one of the thousands of rock carved homes and buildings. 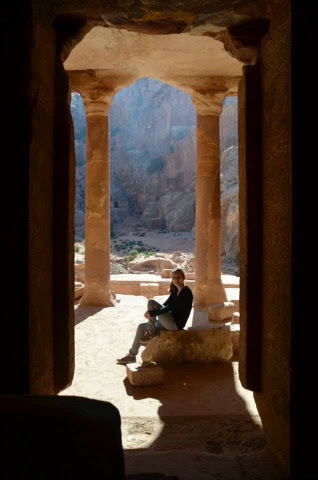 Petra's history starts as early as 312BC with the Nabataean culture who carved the city of Petra and created the trading hub of the Middle East. With thousands of inhabitants and hundred of thousand traders visiting, Petra had to be designed to sustain them all. Built in the middle of the dessert, water was one of the big challenges. 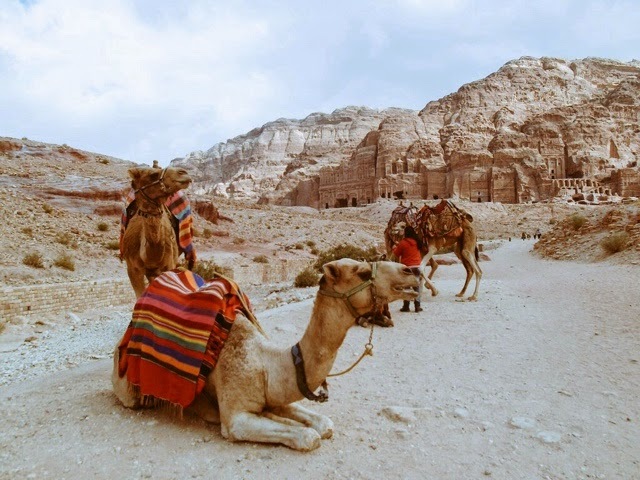 Nabataean people created systems of aqueducts and cisterns to collect the water, it's convenient location near Wadi Musa (Valley of Moses- where it was said that Moses used his staff to bring water from the ground), gave Petra a natural source of water. 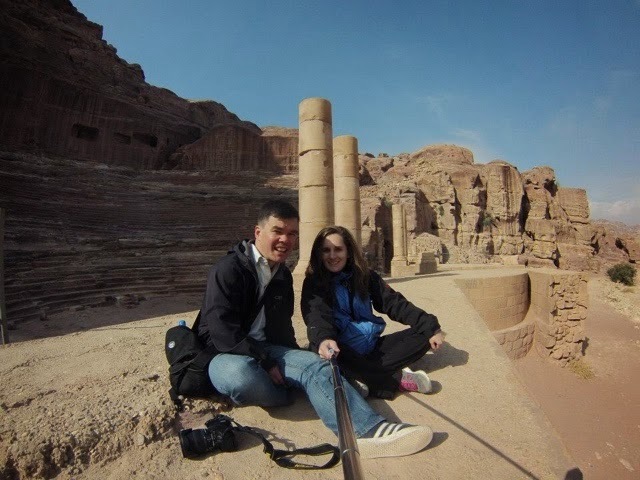 Exploring Petra takes time, although they sell a one day ticket, one day is not enough to see most of Petra's most famous sites. 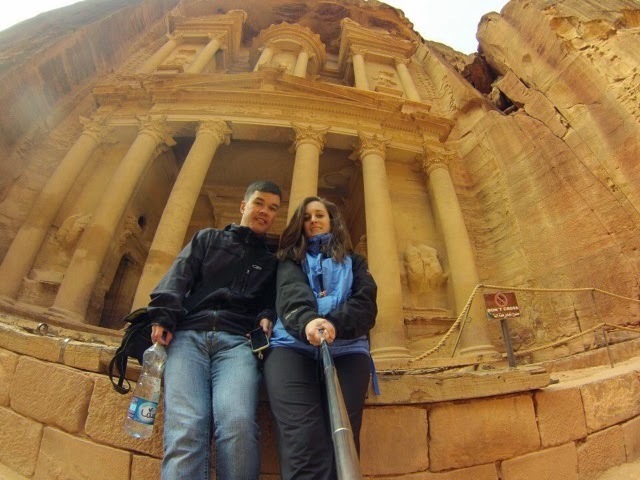 It's a good idea to have at least two days, if your a fast hiker you can see most of Petra in two days. As you walk Bedouin people will be offering you their wares. Some will offer you rides on their horses, donkeys and camels, they might even say it's "free" or "comes with your ticket". Do not believe them, as soon as you get on they will not let you off without paying a hefty fee. If you need to ride, negotiate a price before hand, and stick to it. Some of the animals don't seem to healthy, so be sure to choose carefully. But if you are able to hike you won't need to ride. The first thing we did was hike to Urn/Silk/Corinthian Tombs on the right side of Petra valley. You can enter these temples and the views from their entrances is spectacular. From here we took the long hike up to the monastery. This is the furthest building on the map. It's good to start early, especially if you don't like stairs. Just like the Treasury, the revealing of the Monastary is breath taking. The grueling hundreds of stairs will be forgotten when you turn the corner and the Monastary appears out of nowhere. Even more impressive than the treasury, the Monastary towers 50 meters high. At the top you can enjoy a outrageously priced tea and snacks with a view of the Monastary. From there you can hike to the various view points. Each trail has a sign claiming "best view", to settle the competition my friend and I hiked to each of them. They all offer different vantage points and it's hard to say which is best. 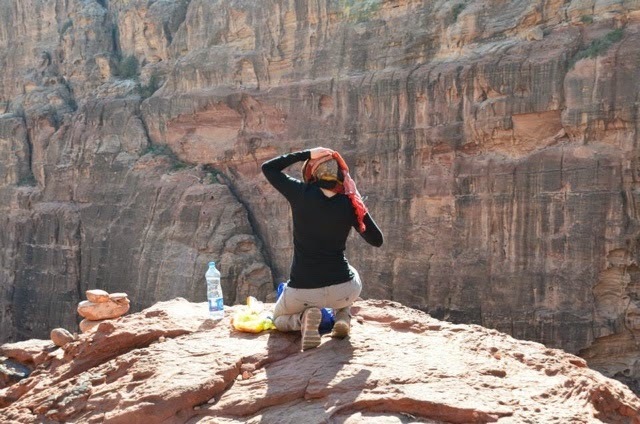 The view is composed of what the bedouins call the "Jordanian Grand Canyon" and the Monastary. On the way back we visited the free standing Roman temples, walked along the Roman road and visited the amphitheater. All of this along with picture stops took the whole day it was about 15km of walking. When we were good and tired, we hitched a ride on camel back to our bedouin homestay with Mariam (find her on airbnb) in Umm Sayhun. Although they offered it to us "free" since they were going back too we negotiated to pay 15JD for two, half of what they usually charge. 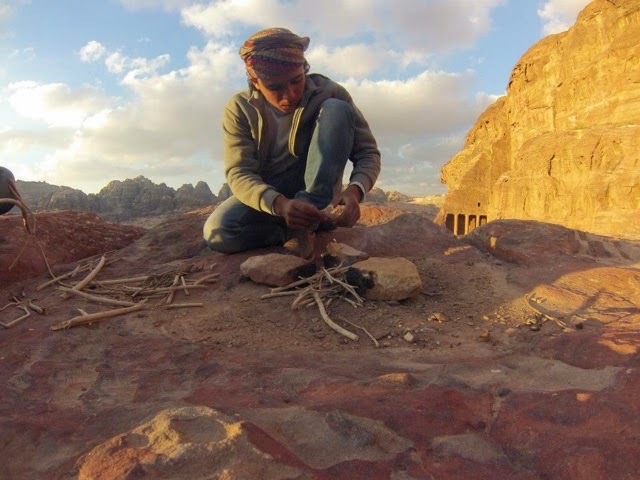 We had tea upon a rock before setting off on camel through the desert back roads of Petra. I realized that the half priced ride also came with a wedding proposal. 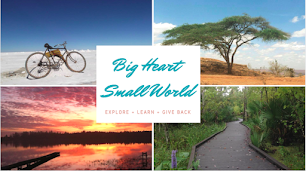 Not the first time I have been proposed to while traveling, I decided to show indifference. The young Bedouin suitor dropped me off at home and left his number. With no intention to call him I thanked him and headed inside. After 17 missed calls to my host mother, we finally told one of the Bedouin leaders to tell him to stop calling. At the home we enjoyed a dinner of chicken, hummus, salad and pita. The next morning we woke up early and headed back to Petra. The second day we hiked up to the high place of sacrifice, it wa really interesting and the views were amazing. We took the back road down from the high place of sacrifice to the Roman Soldiers Tomb and the Garden Tomb. From here we set off through the desert toward the Columbarium. Instead of going back to meet the roman roads we looped around a mountain towards the Monastary, we took a trail carved into the cliff which lead back down toward the museum. We took a quick peak at the artifacts in the museum and then headed back down the Roman road to the trail that would lead us to the viewpoint overlooking the treasury. To find this trail, head toward Sextius Floentinus Tomb and continue past it heading away from the main road, here you wil find a set of staircases to your right. 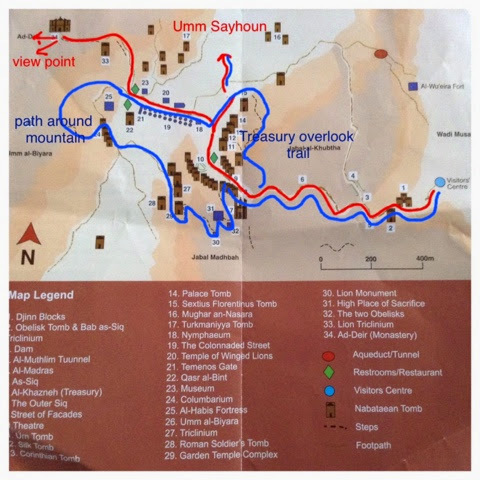 Hike up until you reach the top, the trail seems to end, head to the left to find a less well marked trail that leads you in the direction of the Treasury. You will see a small flag and the treasury to your right. Continue walking to the viewpoint. Here you will find a small tent with cushions and rugs and a nice Bedouin man that will offer you tea. Sit down and enjoy the view of the treasury and hear the yelling, laughter and camel screams from below as people stumble upon this gem. We returned down the stairs and headed home through the secret back entrance, this time by foot to prevent any more marriage proposals. It's a long hard journey through soft sand back up the the Bedouin village of Umm Sayoun. Here we were picked up by a cave dwelling Bedouin man for a once-in-a-lifetime stay in a true Bedouin cave. Below see a map of my two day guide to petra. Red is day one and blue is day two.